My work is closely linked to the changes of the seasons, the cool green, cobalt blues and dove greys of Winter, the lemon yellows, whites and pale pinks of Spring, the crisp bands of crimson, magenta, violet, golden yellows and fuchsia pink of Summer and the deep burnt oranges and umbers of Autumn are the constant source of inspiration for all my textiles and prints. Winter to spring, spring to summer, summer to autumn, autumn to winter, my designs are influenced by the cyclical nature of the plants, tree and insects that inhabit my garden in Kent. The stark dead heads of the Hydrangeas and Honesty in winter, the tall elegant grasses and exotic ferns of spring, the shock of colour in the herbaceous border in summer and the graphic seed heads of autumn, are chosen by me to reflect their fragile beauty and structure. Arranging these organic forms onto hand dyed papers and overlaying them with vintage lace and patterned knitwear reminiscent of the 1920’s and 30’s, the image becomes permanently recorded through heat transfer onto either soft warm fleece of floaty chiffons, fixing a particular moment in time for eternity. 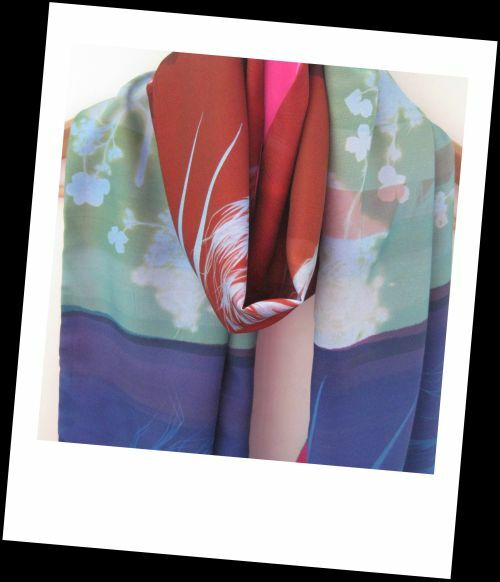 Each katyb scarf is a unique, hand printed, hand sewn work of art which brings you a step closer to nature. Although all print work is bespoke, I am happy to base unique orders on pieces already created and sold. If you scroll through the gallery and come across some artwork you like, simply send me an email with an attachment of the picture and we can discuss the design further.